Made with fresh Scotch Bonnet peppers from the hills of Jamaica, brought to you right here in Japan and delivered to your door step. Why settle for the rest when we bring you the best. This pepper sauce contains no fat and actually burns fat and other impurities from your body. It is even said that the peppers directly attack cancer cells. ( old people saying) It’s made with scotch Bonnet pepper, vinegar, salt, spices and a little potassium sorbate to preserve this product's shelf-life. But don't worry, the percentage is very low ( 0.1% preservatives) Enjoy Walkerswood Scotch Bonnet pepper Sauce with a variety of meals to give it that extra kick! Made with fresh Scotch Bonnet peppers from the hills of Jamaica, brought to you right here in Japan and delivered to your door step. Why settle for the rest when we bring you the best. This pepper sauce contains no fat and actually burns fat and other impurities from your body. It is even said that the peppers directly attack cancer cells. ( old people saying) It’s made with scotch Bonnet pepper, vinegar, salt, spices and a little potassium sorbate to preserve this product’s shelf-life. 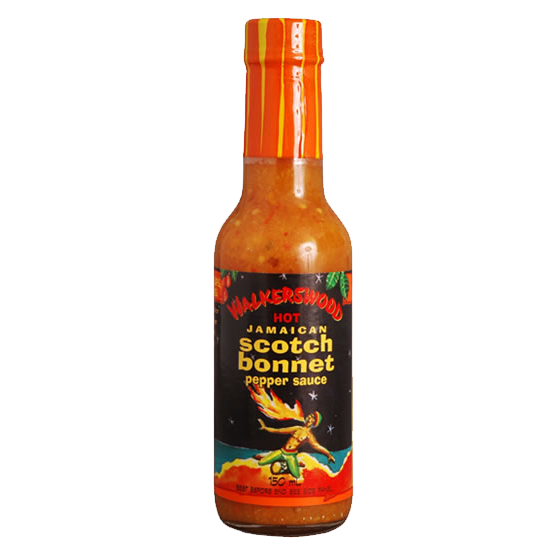 But don’t worry, the percentage is very low ( 0.1% preservatives) Enjoy Walkerswood Scotch Bonnet pepper Sauce with a variety of meals to give it that extra kick!